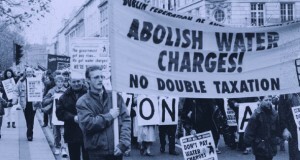 Green Party/Fianna Fail pledge to reintroduce water charges will spark a water war. Massive boycott will erupt – again. Monumental hypocrisy in talking about reducing water waste in view of utter inaction of last 15 years. This would be another intolerable imposition on the incomes of hard-pressed working people arising from the chronic crisis in Irish capitalism. Warning – Water charges coming back!